Three weeks ago I had time for a 2-night backpack, and decided to see snow-covered Mt Adams at its best. Everything worked out great, even though nights were colder than I anticipated from the forecast. Snowline was at about 8000', and down to 6500-7000' on glaciers - just an inch or two of new snow, but it made the mountain look fresh and wintry. I set up camp at Killen Lake late Friday night. Temps went down to mid-20's or so - my water froze in the tent, and tent got all covered with sparkling frost on the inside (this was quite nice with a flashlight!). I got just a bit cold, shared warm clothes with my dog Ferney and he was a happy camper (got to appreciate his enthusiasm going with me on the hikes - he used to be afraid of wilderness but now he really enjoys it). I slept late as it got warm in the morning, and then we headed to High Camp and continued on rough climbers' trail to Glacier Lake at 7500'. When I went down past the lake, a group of climbers were setting their tents for the preparation of North Face climb. It would be cool to read how it went, looks like epic climb by any measure. On the second night, I decided to move my tent under the trees, to reduce heat loss. The night started quiet - but then powerful gusts came after 11pm (I was on a small ridge by the lake) and by 1am constant wind was battering my tent. I was thinking about the climbers, how did they do in their camp far above the timberline? At around 2am I finally decided to relocate my tent back down in the gully, and got some sleep. It was a bit warmer than previous night, and night sky was amazing. Sunday morning I woke late again, to another gorgeous day on the mountain. This time I decided to stay local and explore Killen Creek Meadows, before heading back. Next lake downhill is probably the largest in the group of 3 right after snowmelt, but now it was almost dry. This long/narrow meadow was perfectly aligned to have a view of both Adams and Rainier. Wow, the water level in that high tarn is really low. I didn't realize it shrank down that much. Seems like I was there in an October once. Fooled by the glacial mantle! Yep, that'll happen. The big flat icefield you described can probably be considered a piedmont glacier, a feature where a glacier leaves the confines of a narrow constriction and spreads out into a large open space. While it's not as striking here as what you'll see when you do an image search for piedmont glacier, it's the only decent example I've encountered from Shasta to Rainier, inclusive. It's not the cold nights that bother me as much as the long nights. Alpine camping this time of year is miserable! I can't imagine moving camp in the middle of the night, as you did. I'd just wait it out, no matter how bad. Sticks on the tent? Did that help withstand the wind? I don't mind the long nights. I'll usually build a fire which is good for a few hours. Sleep a bit longer than 8 hours. Maybe read for a while. Googled it - that definitely looks like a small version of piedmont glacier, very different from other glaciers I've seen (just a few, actually) and seemed more like a giant snowfield. Looking at upper glacier, it almost feels strange it could fill such a wide valley below, but then it was my perspective, it's not as narrow as seems from Glacier Lake and most likely a fast-moving one. Yes long nights mean spending a lot of time at camp; I've almost fallen out of habit for having a fire, but this would be perfect time and place for it. And there's always a cell phone with some games or good reads. 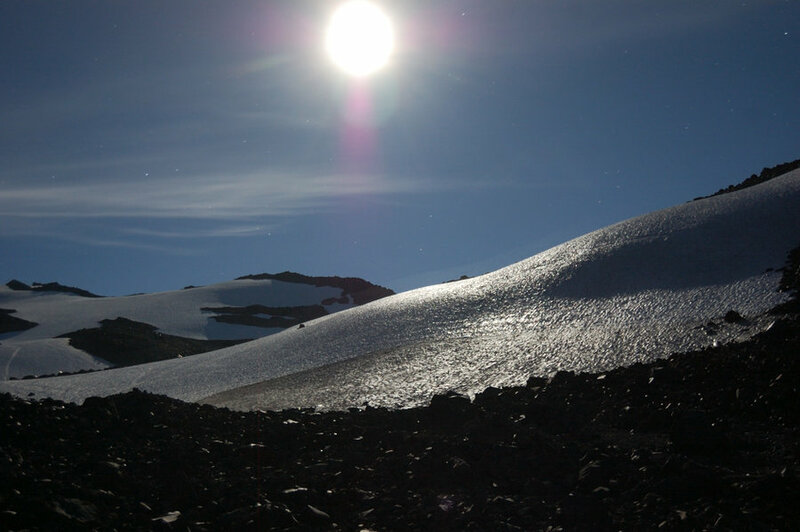 I hike a lot by flashlight or by moon; on next late-season trip I may plan to camp during full moon, somewhere near the snow/glaciers - one time I did it was bright enough to read a book. Thanks, Jerry! And yes, no bugs at all. I had better luck with mosquitoes camping in Indian Heaven in early/mid summer, than camping on N side of Mt Adams . Fall is the best time to be there. The sticks do indeed help me sleep on windy nights (I think about tying them together next time, like a tepee), and sometimes I put rocks inside as well, if I leave my tent in a windy spot. Thanks for the great TR. I now feel better about exploring Adams and it looks like the North approach is a good option. Also May consider big sticks on the tent to address wind conditions.